After years of inaction, federal regulators are trying to crack down on the use of cheap novelty helmets linked to thousands of motorcycle crash deaths and injuries in recent years. The novelty helmets do not comply with federal safety standards, and provide little or no protection against head injuries in a crash. Still, as FairWarning has reported, tens of thousands of the helmets — also known as “loophole lids” or “brain buckets” – every year are imported from overseas and peddled over the Internet. But now the National Highway Traffic Safety Administration is proposing rules to cut off the supply of novelty helmets and make it easier for state law enforcement officials to identify offending gear on the road. Together, NHTSA officials say, the moves could save dozens or even hundreds of lives annually. The helmets are snapped up by motorcyclists because they sell for as little as one-third the price of compliant helmets; lighter and less durable, they also offer more comfort. For years sellers have skirted the law by using disclaimers that say the helmets are not intended for highway use — even though they have been marketed to motorcycle riders. The NHTSA proposal would for the first time require distributors to make sure the helmets they sell comply with the agency’s standard for manufacturers, known as Federal Motor Vehicle Safety Standard No. 218. 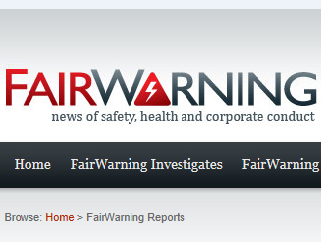 They would also limit the ability of distributors to insulate themselves from legal liability. The rules appear to give NHTSA the power to shut down novelty helmet distributors as they currently operate. Federal officials have long been aware of the dangers of novelty helmets. In the Federal Register notice of the proposed rule, NHTSA cited a 2009 study of injured motorcyclists in Maryland. In the study, 56 percent of those wearing a novelty helmet had serious head injuries versus just 19 percent of riders wearing a DOT-certified helmet. 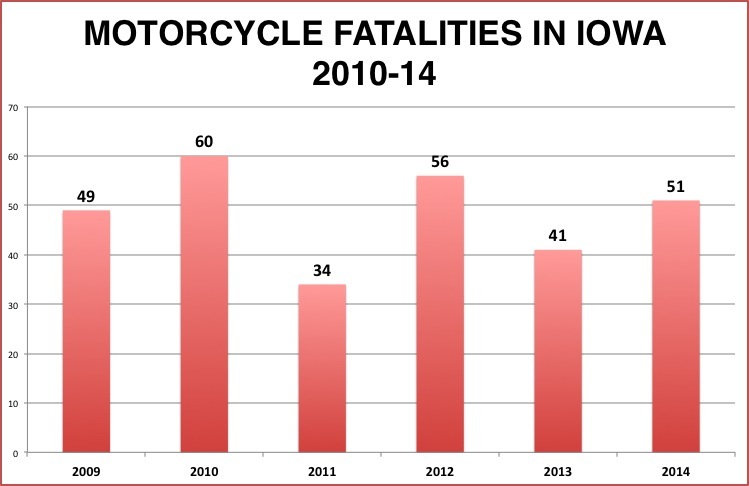 Eight people died in seven Iowa motorcycle crashes in January through April 2015. Monthly Iowa Department of Transportation stats are at this link. Novelty helmet use is especially common in some states. NHTSA reported that in states requiring helmets, the proportion of motorcyclists observed wearing substandard gear has ranged from 8 percent to 27 percent. Currently, 19 states and the District of Columbia require motorcyclists of all ages to wear helmets that meet DOT or other standards. NHTSA is seeking public comment on the proposal until July 20. Even if a final rule is adopted, the agency said, manufacturers would have two years to comply. 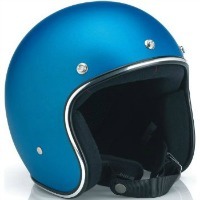 The novelty helmet industry and rider groups are expected to contest the proposal. NHTSA said 235 to 481 lives could be saved every year if all novelty helmet users in states that have helmet laws switched to approved helmets. Even if just 5 percent to 10 percent of current users made the switch, 12 to 48 lives annually would be saved in what the agency called “a modest and achievable projection.” The estimated extra cost of a DOT-approved helmet, NHTSA said, is $48.92. A novelty helmet for sale on the Internet. The proposal would also give police simple tests to identify illegal helmets, and curb a practice of riders using counterfeit DOT helmet stickers to avoid detection. For example, any helmet with an inner liner that is less than three-quarters of an inch thick would be considered inadequate. Law enforcement could measure the liner thickness with a thin metal probe such as a pin or needle. “For law enforcement, this is a good thing. It gives us something that is tangible,” said Jim Halvorsen, a retired New York state police lieutenant, and motorcycle safety expert. But Halvorsen said questions remain about how vigilantly such a law would be enforced because many cops are still unable to distinguish novelty helmets while others have a laissez-faire attitude. The Governors Highway Safety Association estimates that motorcycle fatalities totaled 4,584 in 2014. The figures have declined in recent years, but still are up 85 percent from 15 years ago, even as highway deaths overall generally have declined. According to the association, motorcycles account for just 3 percent of registered vehicles but 14 percent of traffic fatalities.